This is the other slice I made, to go along with the Raspberry Coconut Slice in the last post. 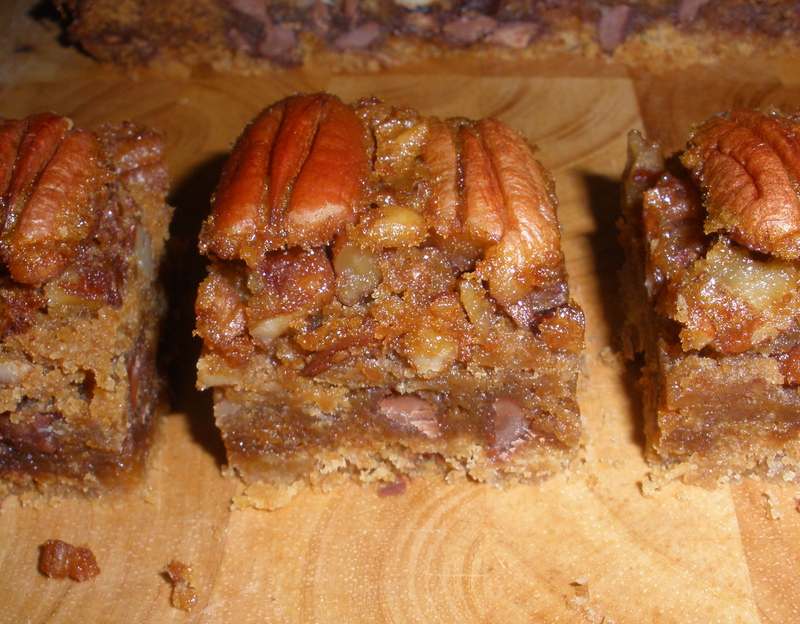 A very sticky, nutty, yummy slice. Make sure you grease and line the pan even if you use a non-stick pan, as the top layer will leak around the edges of the baking pan and stick in a few spots which will make it difficult to loosen the slice from the pan. Preheat oven to 180C. Lightly grease a 16x26cm baking tin and line base and sides with baking paper. Sift flour into a large bowl. Add sugar and stir combine. 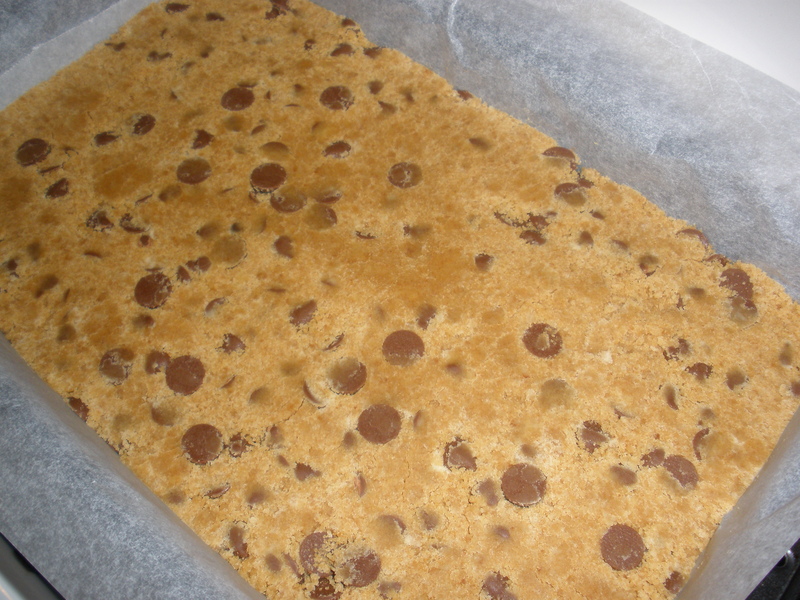 Add butter, mix well then fold in the chocolate chips. Press into the prepared pan and chill in the fridge for 20 minutes. Transfer to the oven and bake for 20 minutes, or until lightly browned. Remove from the oven and allow to cool. Combine eggs, brown sugar, melted butter, golden syrup and vanilla in a medium bowl, mixing well. Roughly chop half of the pecans and stir into mixture. 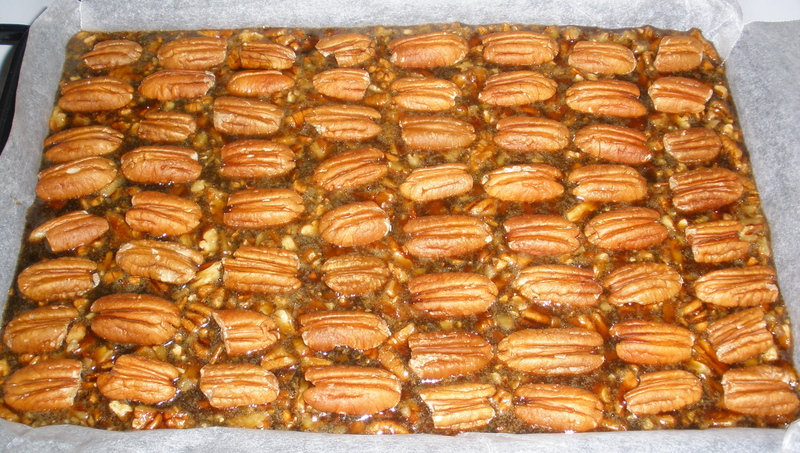 Pour the topping over the cooled base and gently place remaining pecan halves on the top. Bake for 30-40 minutes, or until the topping has set. Cover with foil if the nuts are browning too quickly. Allow to cool in the tin before slicing into pieces to serve.